Posted on Tue, Mar 6, 2012 : 12:36 p.m.
Mirroring a nationwide trend, the University of Michigan has experienced growing enrollment from Chinese students, the Detroit Free Press reported. Chinese student enrollment at the University of Michigan grew 19 percent from 2010 to 2011, the newspaper reported. Chinese enrollment is also up at other state universities, including Michigan State University, which experienced a 400 percent growth over the last four years, the article said. Students on the University of Michigan Diag. Increased enrollment from Chinese undergraduates helped fuel a 5 percent increase in the number of international students at colleges and universities in the United States last year, a report from the Institute of International Education found. Chinese student enrollment in the United States rose to nearly 158,000 students, almost 22 percent of the total international student population, the report said. China sent more students to U.S. universities than any other nation. India and South Korea were second and third, respectively, the report showed. Those nations were also the top three represented at U-M, with China sending 1,747 students to U-M in the 2010-11 academic year, according to a previous article on the report on AnnArbor.com. The same report put U-M at No. 8 on the list of U.S. universities with the highest concentration of foreign students. Wed, Mar 7, 2012 : 4:30 p.m. Wed, Mar 7, 2012 : 4:13 p.m.
Where is the outrage over the fact that numerous investigative reporters have shown that over 50% of applications from Chinese students contain FRAUDULENT materials, including test scores, transcripts and reference letters? Or that many of these students pay tens of thousands of dollars to have their essays written for them, along with the entire contents of the application? What are US and Michigan universities doing to address this fraudulent activity that affects the ability of US students to get into the institutions that our states assist in funding, and which receive billions and billions of federal tax dollars in research funding? 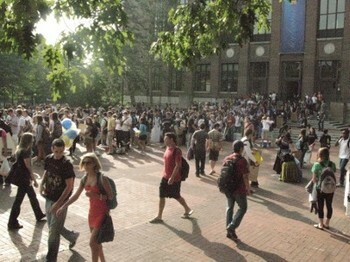 Wed, Mar 7, 2012 : 3:08 p.m.
And how many of them stay here after they graduate? And by here I mean in the country not just the state of Michigan. Wed, Mar 7, 2012 : 2:04 p.m. I've spent a little time with UM students from China and Taiwan, and overall were extremely nice, intelligent, interesting people. I wonder if there is a program for foreign students to spend time with local residents during holidays or other occasions...sometimes our holiday table could use a little more cheer/interest (and who doesn't get bored of the same-old every year?) Some of the home-countries students come from may be or are antagonistic to the US, but let's show the students visiting here why the US is such a unique, amazing place (and with unique, amazing, good people). Your comments make too much sense, that is not allowed on the mlive boards. Wed, Mar 7, 2012 : 1:21 p.m.
Just maybe the K-12 schools in the USA aren't doing their jobs educating! Wed, Mar 7, 2012 : 3:10 p.m.
Tue, Mar 6, 2012 : 11:10 p.m.
That's cool....give a top notch education to our biggest global competitor, while excellent students right here at home don't get a chance. Tue, Mar 6, 2012 : 10:16 p.m.
Chinese and other Asian students may be the new wave of immigration in the USA. Many of them have a desire to stay here so as to have a career and become US citizens. Afterall, China is still under Communist Rule and opportunites are limited over there. A two class system has emerged over there: the Elite and the working class. Most of us know what kind of wages and working conditions exists in China. White collar jobs are perhaps much more scarce which is why they come here not only to be educated but remain. All of this tells me the Universities will accept those who will pay the tuition but who will be more likely to graduate. It is sad to see the &quot;American&quot; born student becoming a minority. There are several obvisous reasons for that, maybe another story line at another time. Tue, Mar 6, 2012 : 9:59 p.m.
Higher Education and National Security: The Targeting of Sensitive, Proprietary, and Classified Information on Campuses of Higher Education, this has been ongoing and many will deny or bury their heads in the sand, year after year many foreign students from China, Iran and other countries with a different ideology of the US have been deported for various charges, from stealing confidential information from Nuclear science, cyber technologies and products and a variety of many sensitive information for the benefit our their countries. You know what they say about smiling faces. Tue, Mar 6, 2012 : 10:18 p.m.
For every deportation, there is a thousand or more who stay and remain productive. Tue, Mar 6, 2012 : 9:38 p.m. When the article reports Chinese students, are these from Taiwan or Mainland China? I presume Mainland China since the Taiwanese have been here for the last 30 years! Tue, Mar 6, 2012 : 9:34 p.m.
Where is it best for socialists to learn to be socialists? From other socialists of course (US University professors). Is there a comment here? Please clarify. Tue, Mar 6, 2012 : 8:21 p.m.
Tue, Mar 6, 2012 : 8:59 p.m.
Every single student in Michigan who desires to go to a public university in Michigan is able to do so at one of 13 public schools based upon their abilities. Tue, Mar 6, 2012 : 6:53 p.m.
For all the complaining mediocre white people did about affirmative action, is the end result of all their efforts just the replacement of black and Latino students with Asians? Tue, Mar 6, 2012 : 9:37 p.m.
Tue, Mar 6, 2012 : 7:33 p.m.
Only if the Asians are admitted by lowering standards or because they're Asian. Tue, Mar 6, 2012 : 6:31 p.m.
Tue, Mar 6, 2012 : 8:14 p.m.
Tue, Mar 6, 2012 : 7:15 p.m.
glad to know the censorship police are standing guard. Tue, Mar 6, 2012 : 6:25 p.m. I'm not a far right wing kook although I occasionally play one on the Internet. But there is a small irony in this story considering China as a whole is arguably (New York Times) the largest thief of intellectual property on the planet. Tue, Mar 6, 2012 : 6:19 p.m.
Well, this is one way to balance that trade deficit with China. Tue, Mar 6, 2012 : 8:31 p.m.
Not really. You have to consider that there is usually a similar percentage of foreign academics to foreign students in the university system... the money in effect goes to them. Then the graduating foreign students get to compete for jobs in America with Americans. Unfortunately there are few opportunities the other way around. Tue, Mar 6, 2012 : 6:13 p.m.
we have in state/out of state tuition rates do we have in country/ out of country rates? What about in continent/ out of continent rates?